Traditionally Tamindir.com defines many statistics about the download habits of users’ on technological content, applications, games and software through the years. In 2016 the case has not changed. The data in this report gathered and analyzed by real time user visits, behaviours, interests by pointing the most downloaded games, applications, similar software and correlated articles in order to pursue Turkish software consumers’ intentions. Tamindir.com’s overall 2016 analysis on general downloading categories and habits can be easily viewed on the attached info-graphic. 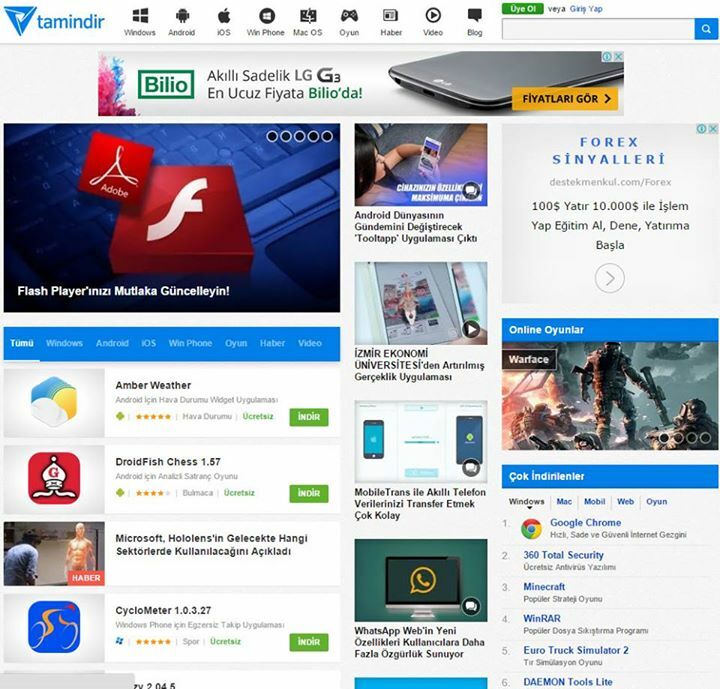 Since 2004 Tamindir.com serves the internet enthusiasts as the most popular download source in Turkey. Today has become the most visited technology news and download web site in Turkey. 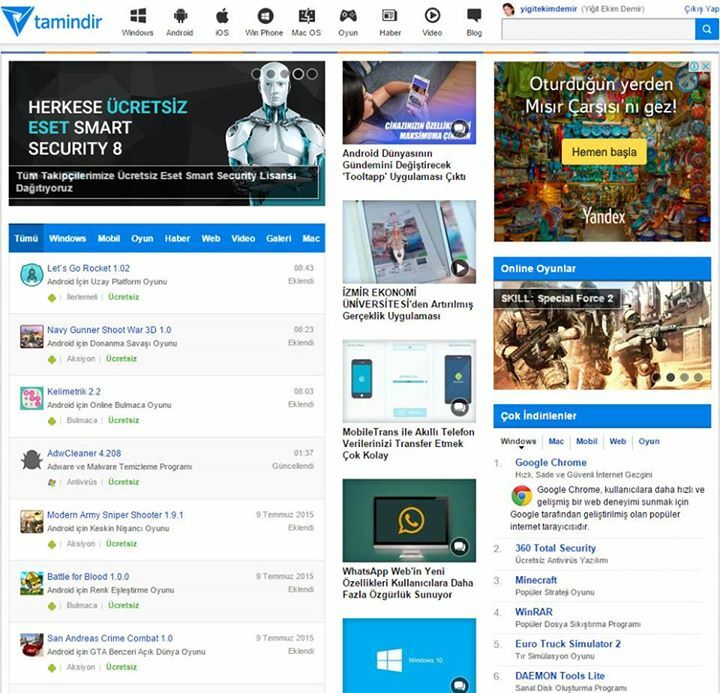 Within 12 years, Tamindir.com has fit in the technological informative news and blogs compartments of web publishing as well. Tamindir.com embodies more than 43.000 apps’s links, 17.000 news and blogs on its web pages. Today, according to verified analysis data; Tamindir.com has an average of 230.000 downloads per day. On mobile platforms Tamindir has reached 350 million visitor since 2013. 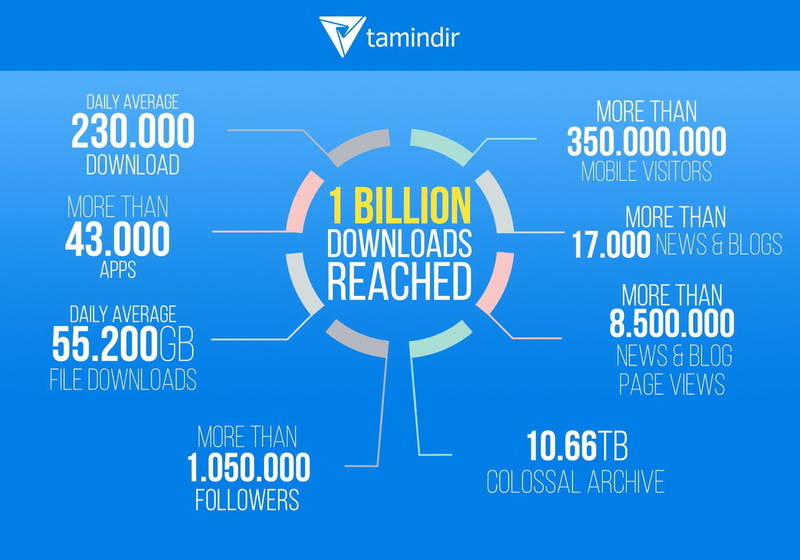 On the other hand social media potential for Tamindir.com has reached 1.050 million followers in a very short time period. As a 12 year old Technology platform, Tamindir.com has achieved many content management triumphs as Golden Spider Information Award and like. Today, Tamindir.com followers downloading 55.200GB of data from average daily from 16.66TB of gigantic archive while an estimated number of 8.500 million of blogs and news readers blending within their own unintentionally self created and preserved community. We have redesigned our mainpage with a couple of small retouches in order to help our visitors have access to mobile apps and programs both via their mobile phones and desktops in an easier way. The scope of this revision process includes bigger icons for software, mobile apps and games. Phone platforms are added to help user discover apps and games compatible with their devices. Finally, featured content display menu is enriched with bigger visuals to impress users and draw attention. Tamindir was founded in 2004 incorporated with CNT Interactive, Inc. and by March 2015, is now 11 years old. We are proud of its successful development process and happy to make it even further as the team of CNT Interactive. As a platform of technology, software and application Tamindir, surely did not make this way by itself. Our team’s devoted works, our visitors’ ambitious supports and our partners’ qualified cooperation made an immense contribution to Tamindir in this 11 years. By means of program and application downloads, videos, technology news and guides, Tamindir became a huge reference guide to anyone who looks up for a source in technology. With this way, many developers and producers who would like to share their applications, software and products choose Tamindir to reach their target users. Tamindir’s new infographic will be an informative guide by means of our user habits and what we have achieved in 11 years. Tamindir 2014 Download Trends Report can also be a vast guide for users to see the download trends of the year in industry-specific way. We have a strong belief that we will continue to carry this success in Turkish internet. Happy new year!